I paddle most often in the San Francisco Bay Area. In these winter months, our Mediterranean climate brings rain, and around here that means that the coastal waters are about to become far more polluted than normal. What causes this increased level of pollution, and how is a paddler to cope? On one level, the San Francisco Bay (which is an estuary, not a bay) is like a lot of other urban areas: Rainfall washes off the streets and roads, adding all manner of toxic compounds into the water. However, the watershed that drains into the Bay includes tens of thousands of acres of agricultural lands as well. 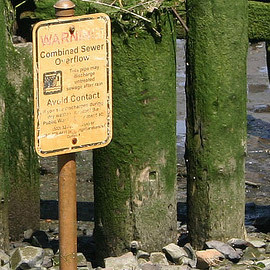 To make matters worse, San Francisco uses a combined stormwater-sewage system, creating automatic wastewater overflows during intense rainstorms. To complicate matters further, there are several sewage treatment plants that rim the Bay that serve coastal towns with decrepit sewage infrastructures that will also overflow into the estuary during heavy rains. Sausalito, a Bay Area town with several top-tier put-ins for boaters of all kinds, is infamous for its history of spills ranging from 40,000 to 500,000 gallons of sewage. As of 2010, the San Francisco Bay was surrounded by 7.15 million people in nine counties, so the environmental pressures on its waters are staggering. And the saddest part is that the waters around San Francisco aren’t unique in terms of pollution. Many cities, and even rural waterways, have failing or even illegal sewage systems. Some mandate that no one should swim for 72 hours after it rains, owing to runoff-borne pollution or waterborne pathogens. Clearly more needs to be done to protect our fragile waters and the lives they touch, from marine mammals to fish to birds to paddlers. We’re in an economic downturn with lowered tax revenues and municipal governments that are constantly cutting budgets, so such changes will take even longer than normal. It will take citizen activism and reporting to help make necessary changes! Yet urban waterfronts call to some of us, and for others it’s the only convenient place to paddle. How does one mitigate the risks of paddling in such waters? Watch the weather…and the news. Find local agencies, NGOs, and nonprofits that manage and/or track water quality. In the Bay Area, these include the Bay Area Clean Water Agencies, the State Water Resources Control Board, the Natural Resources Defense Council, and even the EPA. Heal The Bay issues excellent weekly water quality report cards, which I check every week before paddling. Watch the water. Sometimes you can actually see polluted waters or detritus on the surface. Brown froth can be caused naturally at sea, but inside coastal waters, it’s often not a good sign. But don’t take a lack of visible pollution as a sign that the water is safe. Be careful with scratches, scrapes, or wounds in wintery urban waters, especially on your hands. They can more easily become infected. Dirty or infected waters don’t happen only during the winter! Swimming may be banned in any season and in any body of water, often because of waterborne pathogens such as E. coli. This is especially true in areas that might have agricultural runoff, even without recent rain. Don’t go for rolling, rescue, or recovery practice near wastewater treatment plants, especially 1-3 days after a heavy rain. After a recent rain or water quality warnings, avoid getting in the water in areas that don’t drain directly out to sea during ebb tides, like small coves or areas behind jetties. Wash your hands and gear thoroughly if you’ve been paddling in waters that you think might be less than pristine! The good news for Bay Area paddlers is that the waters in our region are the cleanest they’ve been in many years, but this also could be due to an unusually dry 2011-2012 winter. Such good news is worth celebrating, but we can’t become complacent. Be smart and aware about water quality as you paddle, and better yet, get involved in keeping your local waters clean and holding polluters accountable!